I was thinking about this crazy squirrel we came across at Epcot. This little fella was nuts. He was determined to get some of our food. It didn’t matter how many times we swatted at him, shouted at him, or tried to scare him…he just kept coming back. 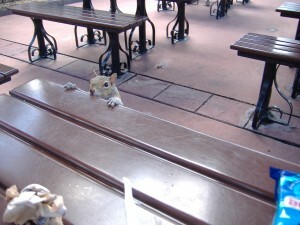 He had obviously tasted of the table food before, and obviously knew it was much better than the typical squirrel chow. Because of this determination to taste the ‘good stuff’ again, he had become fearless in his pursuit. 100% of his little squirrel heart was after what was, in his mind, ultimate success. We could learn from this squirrel, we should become fearless in our pursuit of our goals, dreams, and visions in our life. We shouldn’t allow others to scare us away, rather continue to forge forward towards our ‘good stuff’.